ANNVILLE, Pa. (Football) – The Middle Atlantic Conference (MAC) has announced its football weekly award recipients for the week ending Nov. 4, 2017. 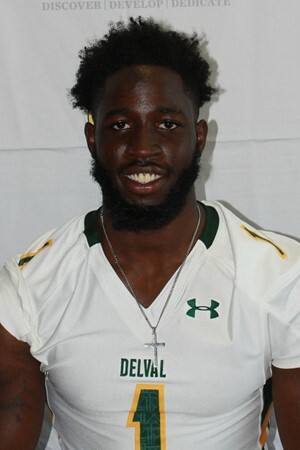 Devauntay Ellis (Delaware Valley / Sr., TB / Ewing, N.J.) was finished for the day midway through the third quarter in No. 5 Delaware Valley’s 51-7 win over Misericordia, and he was impressive in the time he played. Ellis carried the ball 19 times for 231 yards and five touchdowns. The win clinched the Aggies a share of the MAC title heading into the final week of the regular-season. The five scores were the second-highest single-game total in school history, while the 231 yards rank fifth on the single-game list. Ellis’ touchdowns went for 21, 2, 9, 76 and 37 yards, respectively. 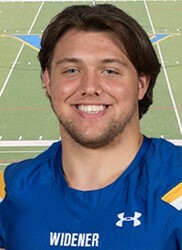 Vince Char (Widener / Jr., DT / Southampton, Pa.) had an outstanding performance with a career-high six sacks, seven tackles for loss and a season-high 13 tackles in a 27-6 win over King’s. Char accounted for more than half of the 11 sacks by the Pride in the win, their highest total since 2015. His six sacks, four of which came in the third quarter, vaulted him into the MAC lead in quarterback stops. Seven of his 13 tackles were solo tackles. He totaled 31 sack yards for loss in his six sacks. Ian Gould (Stevenson / Fr., K / Finksburg, Md.) 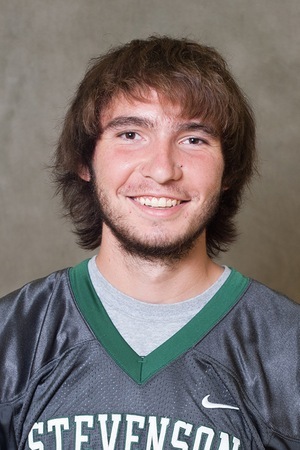 contributed 14 points with his leg in a 44-12 win over Wilkes. Gould was perfect on both Points-After-Touchdown (PAT), going 5-for-5, and field goals (3-for-3). His field goals were from distances of 33, 28 and 19 yards. Gould is now 10-of-12 on field goals and 35-for-35 on PAT attempts. The freshman also averaged 52 yards per kickoff on eight attempts in the win. The Centennial Conference and the Middle Atlantic Conference (MAC) announced on Nov. 5, 2015 their partnership to hold two postseason football games between member institutions. The Centennial-MAC Bowl Series involves the top two teams from each conference that are not selected to the NCAA Division III Championship. The top team from each conference that is not selected to the NCAA Division III Championship will host the second best team from the opposing conference not moving on to NCAAs in one game of the series. This season, 2017, the bowl games are scheduled for Saturday, November 18. The MAC has won all four of the bowl series games through the first two years.